Today the Institute for Apprenticeships officially became the Institute for Apprenticeships and Technical Education (the Institute). From today the Institute is responsible for Technical Qualifications, which is the main, classroom-based element of the T Level. It’s an exciting day for the Institute as we are now driving some of the biggest reforms we have seen in technical education. T Levels are new two-year technical study programmes that will become one of three major options for students to study at level 3 alongside apprenticeships and A levels. English, maths & digital provision – this is built into the classroom-based element of the T Level and is there to ensure students have these transferable skills. How are T Levels being developed? Similar to apprenticeships, T Levels are being designed with employers to give young people the skills that industry needs. In an apprenticeship, groups of employers known as Trailblazers decide what knowledge, skills and behaviours apprentices should develop during the duration of their course. They then design an end point assessment plan that will ensure an apprentice is occupationally competent. T Level Panels will do a similar job to Trailblazers, identifying what core and specialist learning content is required, drawing on the existing apprenticeship standards. T Levels are currently being developed in areas such as Digital, Engineering & Manufacturing, Agriculture and Legal, Finance & Accountancy. 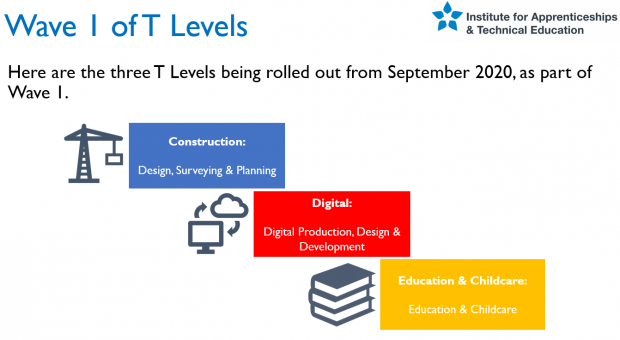 The first T Levels will be delivered from 2020. T Levels will play an important part in helping to fill skills gaps in England and provide new routes into careers that were not there before. Employers who were concerned that they could not find enough people with the right skills will have two high quality routes to recruit and develop the people they need. Finally, T Levels will provide young people with the skills and knowledge required to thrive and to support a flourishing economy. Read more about T Levels on our website https://www.instituteforapprenticeships.org/about/technical-education/.